While the National Golf Centre welcomes all, we respectfully request that the following are adhered to, for the benefit of all. A non-refundable £20 deposit per golfer is required on booking. Smart casual wear, trainers and spikeless golf shoes are allowed in the clubhouse. Blue Denim Jeans are not permitted. Metal or soft spikes are allowed. Conventional golf wear is required: shorts should be tailored and worn with any colour/length of sock. Denim jeans and collarless shirts are not permitted. 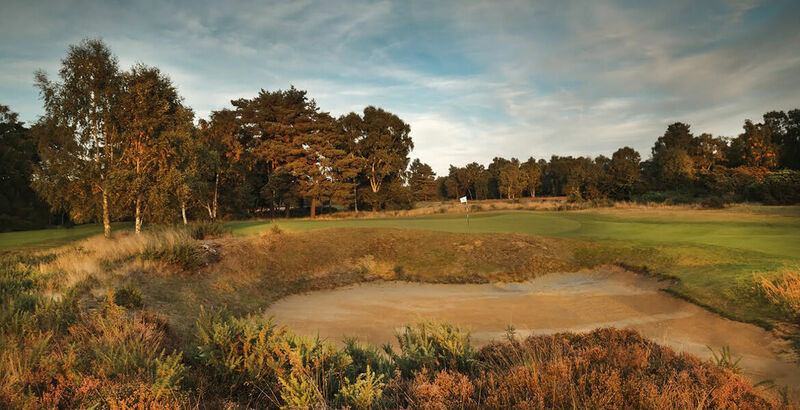 The Hotchkin Course is unsuitable for inexperienced golfers or beginners and has in place maximum handicaps of 24 for men and 36 for ladies. All visiting golfers are required to hold a current handicap certificate that must be shown in the golf shop before play. Mobile telephones must not be used either on the course or in the clubhouse. Strict rules apply to the pace of play at The National Golf Centre, so that all golfers can enjoy their round in a reasonable time. Players must complete their rounds in 4 hours, 11 minutes on the Hotchkin Course and 4 hours, 1 minute on the Bracken Course. All tee times must be booked in advance and the company reserves the right to adjust tee times if visitors are late or numbers change. Golfers must play from the tee of the day unless prior permission has been granted. While four-ball groups are the most common on our courses, we also welcome two- and three-ball combinations and would only pair up visiting parties on request. We respectfully ask all visiting golfers to bring carry bags during winter months poor weather conditions may, on occasion, prevent the use of power caddies and pull trolleys. means loss or deferment of profit, loss of revenue, loss of use, business interruption, loss of contract, loss of reputation, credit or goodwill, loss of opportunity and any other indirect or consequential losses howsoever caused including the negligence or breach of duty of either party to the Booking. means the person, firm, company or other body named in the Booking Form. 2.1.4 by telephone or by e-mail (in which event the Booking becomes binding seven days following receipt by You of a completed Booking Form provided you do not cancel the Booking prior to the expiry of this period or if there are fewer than 7 days prior to the Event Date at the time of payment of the balance of the Price pursuant to condition 4 below). when a contract for the supply and purchase of a Golf Package shall be created on these terms and conditions. 2.2 Your Booking is subject to You making all payments to Us in accordance with conditions 3 and 4 below. 2.3.2 prevail over any inconsistent terms and conditions contained, or referred to, in Your purchase order, confirmation of order, acceptance of quotation, or implied by trade, trade custom, practice or course of dealing. A deposit of £20 for each member of Your Party is required to secure the Booking and reserve tee-times (“Deposit”). Except as otherwise agreed by Us, deposits are payable no later than one week of a signed Booking Form or other written confirmation being received by us, after which time, in the absence of receipt of the Deposit, we may cancel the Booking. Deposits are not refundable in the event of a cancellation except at Our sole discretion. Except as otherwise agreed by Us in advance in writing, the balance of the Price shall be due and payable by You no later than the Event Date. If the balance is not paid by the due date, We may cancel the Booking and retain the Deposit in relation to each member of Your Party. Any reduction in numbers must be notified to us as soon as possible. If we agree with you that the balance of the Price shall be payable after the Event Date, the balance is payable within 14 days following the date of Our invoice. You may change numbers or cancel Your Golf Package at any time provided that the cancellation is made in writing. We will retain Your Deposit and cancellations made after any balances have been paid will result in forfeiture of all monies paid or due at that time. For the avoidance of doubt, if the number of members of Your Party on the Event Date is less than the number in Your Booking, any Deposit paid in relation to the members of Your Party who do not attend the Golf Package will be forfeit and may not be used as part payment of the balance of the Price for the remainder of the Party. 6.1 If You instruct Us to arrange accommodation for You or any members of Your party, we will enter into a contract with a hotel on Your behalf. In the event of a cancellation or amendment, You agree to indemnify Us from and against all costs, expenses, charges incurred by Us in making the booking or in relation to an amendment/cancellation together with any costs, expenses, charges, losses, fines or penalties incurred or imposed by any of the suppliers through which arrangements have been made. 6.2 In circumstances where we have agreed to arrange accommodation on Your behalf in accordance with this condition 6 any additional food, beverages, and room extras must be paid directly to the hotel on departure. 7.1 If You require catering services or any other optional extras as part of Your Golf Package, then this may be arranged at the time Your Booking is made. Such orders can be made at a later date but if made within 2 weeks of the event-taking place, whilst every effort will be made, availability is not guaranteed and extra costs for delivery may apply. 7.2 We reserve the right to charge You in full for any catering arrangements which are not utilised by You or Your Party and which have not been cancelled by giving at least 48 hours prior notice. All members of Your Party must hold a current handicap certificate or an EGU Associate Member’s Handicap and We reserve the right to refuse access to You or any members of Your party who do not hold a current handicap certificate. 9.1 It is Your responsibility to advise Your guests to wear appropriate golf attire on the Event Date. Guidelines for dress on the course and in the clubhouse are set out in the Codes of Conduct. 9.2 All visitors must observe the Codes of Conduct at all times when visiting the Club. We will do everything possible to confirm Your requested tee times, but we do reserve the right to alter preferred tee times. If for any reason Your tee times should not be available, as part of Our service We will offer You the nearest possible alternative. Although the standard of Our courses are inspected on a regular basis, their actual playing condition may vary from time to time. It is occasionally necessary to carry out essential course maintenance and We are not always aware of when this will occur. We accept no responsibility for the condition of the courses prevailing on Your Event Date. Closure of the golf courses is at Our sole discretion and We will endeavour to provide You with as much notice as possible and any closure will be notified to You as soon as We are made aware. In the event of the courses being closed on the Event Date, We will endeavour to offer alternative Event Dates. If this is not possible, You will be entitled to a refund of any amounts You have paid in relation to the Booking. 12.1 Golf played on temporary greens and tees is non-refundable and is considered to be an accepted part of playing golf. Equally trolley and buggy bans may occur when a course is wet and are determined by Our course manager. 12.2.2 During Your Golf Package: If You are able to play golf on the Event Date but course closure occurs prior to the completion of Your Golf Package You may be offered a full or partial refund at Our sole discretion. 13.1.3 cancelling or accepting the cancellation in which case You will be entitled to a full refund of any part of the Price which you have paid to Us. The options set out in condition 13.1 are not available where any change made is a minor one. 14.1 We warrant to You that the Golf Package will be provided using reasonable care and skill and, as far as reasonably practicable, in accordance with the Booking. Where We supply in connection with the provision of the Golf Package any goods or services supplied by a third party or, utilise any facilities provided by a third party, We give no warranty, guarantee or other terms as to their quality, fitness for purpose or otherwise. 14.2 Except as provided in condition 14.5, We shall not be liable to You by reason of any representation (unless fraudulent), or any implied warranty, condition or other term, or any duty at common law, or under the express terms of the Booking for any Excluded Loss or other claims which arise out of or in connection with the provision of the Golf Package (including any delay in providing or failure to provide the Golf Package) except as expressly provided in these conditions. 14.3 Our liability to You arising out of or in connection with the Booking shall be limited to the aggregate of the amount of the Price paid by You to Us in connection with the Booking. 14.4 We shall not be liable to You or be deemed to be in breach of the Booking by reason of any delay in performing, or any failure to perform, any of Our obligations in relation to the Booking, if the delay or failure was due to any cause beyond Our reasonable control. 14.5.3 which cannot be excluded or limited by law. 14.6 Where You are dealing with Us as a consumer, Your statutory rights are not affected by either the terms set out in the Booking or these conditions. 15.1 You may not assign the Booking or any part of it without Our prior written consent. 15.2 We shall have no liability to You under the Booking if We are prevented from or delayed in performing Our obligations under the Booking or from carrying on Our business by acts, events, omissions or accidents beyond Our reasonable control, including strikes, lock-outs or other industrial disputes (whether involving Our workforce or any other party), failure of a utility service or transport network, act of God, war, riot, civil commotion, malicious damage, compliance with any law or governmental order, rule, regulation or direction, accident, breakdown of plant or machinery, fire, flood, storm or default of suppliers or sub-contractors. 15.3 No variation of the Booking or these conditions shall be valid unless it is in writing and signed by or on behalf of each of the parties. 15.4 A waiver of any right under the Booking is only effective if it is in writing and it applies only to the party to whom the waiver is addressed and the circumstances of which it is given. 15.5 If any provision (or part of a provision) of the Booking is found by any court or administrative body of competent jurisdiction to be invalid, unenforceable or illegal, the other provision will remain in force. 15.6 Each of the parties acknowledges and agrees that, in entering into the Booking it does not rely on any undertaking, promise, assurance, statement, representation, warranty or understanding (whether in writing or not) of any person (whether party to these terms and conditions or not) relating to the subject matter of the Booking, other than as expressly set out in the Booking. 15.7 The Booking is made for the benefit of the parties to it and (where applicable) their successors and permitted assigns and is not intended to benefit, or be enforceable by, anyone else. 15.8 Notice given under the Booking shall be in writing, sent for the attention of the person, and to the address or fax number, given in the Booking (or such other address, fax number or person as the relevant party may notify to the other party) and shall be delivered personally, sent by fax, e-mail or sent by pre-paid, first class post or recorded delivery. A notice is deemed to have been received, if delivered personally, at the time of delivery, in the case of fax or e-mail at the time of transmission, in the case if pre-paid first class post or recorded delivery, 48 hours from the date of posting and, if deemed receipt under this condition 8.10 is not within business hours meaning 9:00am to 5:30pm Monday to Friday on a day that is a business day), at 9:00am on the first business day following delivery. To prove service, it is sufficient to prove that the notice was transmitted by fax or e-mail to the fax number or e-mail address of the party or, in the case of post, that the envelope containing the notice was properly addressed and posted. 15.9 The Booking and any of dispute or claim arising out of or in connection with it or its subject matter, shall be governed by, and construed in accordance with, the law of England and Wales. 15.10 The parties irrevocably agree that the courts of England and Wales shall have exclusive jurisdiction to settle any dispute or claim that arises out of or in connection with the Booking or its subject matter.